Chimpanzees are a species of great ape. 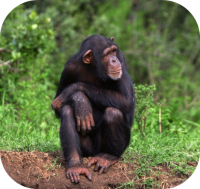 Conservation Status: Chimpanzees are endangered, the main threats to chimps are the loss of their habitat from agriculture and logging. An estimated 100,000 to 200,000 chimpanzees remain in the wild. Size: Chimpanzees are 3-5 feet tall and they weigh 70-130 lbs. 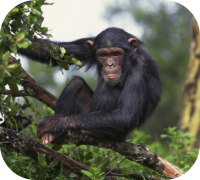 Habitat: Chimpanzees live in Africa, in the dense rain forests, open woodlands, and grasslands. Gestation: Chimpanzees carry their young for 7.5 months. Birth: Chimpanzee babies are 4 lbs at birth. Newborn chimps are helpless and totally reliant on their mother. Chimpanzees will stay with their mother for the first 7-10 years of their life. Female chimpanzees give birth the first time when they are between 12 and 15 years of age. 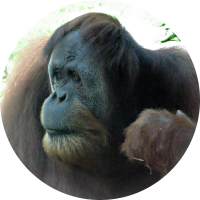 Sexual Maturity: Males chimpanzees sexually mature at 15 -16 years of age. Female chimpanzees are sexually mature at 13-14 years of age. Chimpanzees give birth every 5-6 years. Behavior: Chimpanzees will groom each other and they will use tools as weapons against predators (like rocks or sticks). Diet: Chimpanzees are omnivores,and eat both plants and animals. A chimpanzees diet consists of fruit, leaves, seeds, honey, flowers, buds, bark, stems, insects, and occasionally the meat of small mammals. Chimps will spend 6-8 hours a day looking for food. Description: A chimpanzee body is covered with long black hair, and their face is bare. Chimpanzees do not have a tail, but do have opposable thumbs and opposable big toes, to helps help them climb and grasp objects. Communication: Chimpanzees use body language, facial expressions, hand-clapping, grooming, and kissing as methods of communication. 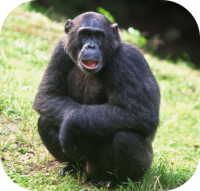 Chimps and humans share 98 percent of their genes. 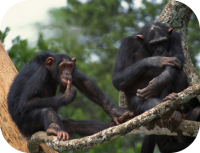 Social Structure: Chimpanzees socialize in family groups of 6-10 individual chimps. 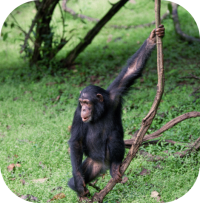 Occassionally a number of family groups will join together to form a community of more than 100 chimps. Mothers will form extremely strong social bonds with their young. Life Span: The average life span of a chimpanzee is approximately 45 years. Unusual: Chimpanzees are highly intelligent and are able to use tools.